Clone hero is a rhythm game based on the famous Guitar Hero game. It is made by Srylain and it incorporates various elements of Rock Band and Guitar Hero III. Some top features of the game are simple songs installation, community support, streamer friendly, and unlimited songs storage based on your SSD/HDD size. In this post, we have included everything you need to know about clone hero including the download links for clone hero v0.21.7 for PX, Mac and Linux, best clone hero charts and best clone hero songs etc. So, here you go! The best thing about clone hero game is that you are able to simply and quickly add the custom songs to the game. Clone hero does not come with pre-installed songs, so what you need to do is find the library of best clone hero charts. You can easily find out custom charts to play on clone hero. The community of clone hero is very supportive, so, it is not hard to get started with clone hero game. To make your job easier, we are recommending you songs to get started with here at clone hero songs. In order to install these custom charts, you just have to drag the chart files to the clone hero folder in the game setup. Moreover, if you have custom charts, you can enjoy the game much more. The above link contains a lot of data to pick from. Our recommended clone hero songs will definitely meet your needs. This section includes the download link of official clone hero game that directs you to latest version of game v0.21.7. This release came as New Year gift on January 04, 2019. But, before you directly go to the download option, here is something you should know about clone hero game. The Guitar hero sales were slowed in the final years of the game. However, there is a community who still has a great interest in the game and they are interested to play the game with the different type of charts specifically with the fret rhythm. In the past few years, the community has opted different solutions to continue the game as the guitars and consoles started to die. They tried to create the mod of Guitar hero and also tried different solutions but they were not successful in achieving the results. However, finally clone hero game came into the ground and it offered the fans much more than the Guitar Hero. The game started off with amazing features including clean backgrounds and user interfaces, fast load time, unlimited storage area for songs and everything is free of cost. The clone hero game also includes the art assets of GH due to which the game face some legal questions and hence these assets are likely to be taken out from the clone hero game. All things considered, the game developers have included the familiarity of guitar hero particularly for the returning players of the game. This is the reason a lot of people get engaged with the clone hero game because when you see the game it looks familiar to the Guitar Hero game. You can download the game for pc, mac or Linux operating system from Clone hero download. A lot of people are searching for a suitable guitar for clone hero game. Well, let me clarify that the clone hero can even be played without actual guitars such as using the game console controller or a simple keyboard. But, having a guitar controller gives you the better pleasure of the game. You can try out 5 fret controller or 6 fret controllers for clone hero. Moreover, any controller for guitar hero can work out for you, but the Windows and Xbox allow you to utilize you the controllers of XBox360. The wired guitar controllers won’t need extra things. You just need to plug in the wire of controller and start playing the game. If you are looking to buy actually guitar controllers, you can consider buying from eBay. Here you can find out great deals of used guitar controllers as well as new ones. you are still unclear about the best guitar controller for your system, you should know that any controller that works on Guitar Hero can work out for you. Xbox360, Xbox one controllers are recommended by a lot of people who are playing the clone hero game. Moreover, the PlayStation controllers can also work out, but there are some issues you can face while setting up the system. If you configure everything, it can also give you a great pleasure. We do not recommend going with Wii controllers, it is because these controllers can result in lag problems so it can ruin your game. According to the experts within the clone hero community, we have created the list of best guitars that can be found on clone hero guitar. In this link, you will find out different options and these will surely help you make your decision. Are you looking for the latest update of clone hero? Well, clone hero has proposed the latest version of v0.21.7 (2019) that came up with many updates. Overcoming various issues in the previous versions, the game offers many more features as well. You can download the latest updated version of the clone hero and can read more about the features of the updated version here at clone hero update. When big names from Guitar Hero started playing this game, a lot of fans joined the clone hero community. The game is growing faster and its latest version v0.21.7 has released without any pre-installed songs and still, the game got thousands of downloads. There is no doubt that the fans are enjoying the game much more than the Guitar Hero. You can download clone hero game for free. The game does not come up with pre-installed songs, so you just have to find out the clone hero charts to add in the game and you can simply find out these charts in our above-given link. So, after you get the songs charts, you just need to install them in your clone hero game. A great thing about the clone hero game is that it supports the custom songs, you can drag and drop the files in the songs folder available there and you are done. There is not any complex system involved. Playing the game with your favorite songs doubles the taste of your game. The clone hero game supports advanced chart features including the Open notes, Broken Sustains, Solo section, and HOPO chords. Using clone hero game, you can go with thousands of custom songs without any bandwidth limits. The updated version of clone hero came up with enhanced practice mode. There are three main charting programs used by the clone hero fans. First one is Moonscraper, this chart was specifically was made for clone hero including the features of whistles and nifty bells. It incorporates extended sustains, mouse, and keys placement modes, charter mode, solo section cues, export song.ini, and drop and drag feature. Some of the best clone hero chart programs with the detailed list of popular charts can be found on clone hero charts. Clone hero game proposes the story sequence which ties in with Career mode, as the game has been available in the most recent GH games. In the Smash Hits, clone hero fans are challenged by “God of Rock” for playing at different Wonders of World keeping in mind the end goal to charge the powerful artifact. Similarly, different challenges are included in the game to add more pleasure to the players. These challenges in the game let the players earn the stars to go to the next level. When you play clone hero game, you need to add your own custom charts in the folder available in the game. You can find out top clone hero charts in the above-given link. The clone hero game is actually a clone of original guitar hero game, but, now the clone hero is being considered a top place to play the guitar hero games. But, the only problem is that the game does not come up with songs pre-installed in it. So, the clone hero users need to find out custom songs to install in the specific folder available in the game setup. After finding the song charts, users can add these songs in the game and can enjoy the game with their own favorite songs. This is actually better than playing the game with random songs. Clone hero songs with the game fans are growing day by day. We searched for best clone hero songs and found an amazing spreadsheet which includes the great list of clone hero charts. You can also get access to that spreadsheet here at clone hero songs download. Clone hero game is supported on the Mac operating system but you need a specific guideline about how to install clone hero in your Mac system. Here I will show you how to download and install clone hero on Mac since the game is officially supported by Mac operating system now, which is pretty exciting and I will also show you how you can add songs in the game and how you can download some drivers that you need for your xbox360 guitar hero controllers, so with all that out of the way let’s get right into this. The first thing you need to do is go to the below link and you will see a mega link which will basically link you to the clone hero download and you can install it according to the steps mentioned in the given link. So, visit clone hero mac for a detailed guide about how you can download and install clone hero game in your Mac operating system. Indeed, even clone hero supports limited hardware; the game has got a popular fan base. Clone hero game has gained more downloads than huge competitors of the game and it is developing quickly. At present, the game network is generally comprised of Rockband and Guitar Hero fans who are disappointed with the absence of new options in the game, yet there is no reason behind why the huge number of previous Guitar Hero fans would not return to play Guitar Hero. To play the clone hero game, you first need to download the game. The download links are given at clone hero live. You can download the game for Windows, Mac or Linux. The game basically played on Windows but can also be played on Mac and Linux operating system as explained in the following sections. Moving forwarding, to install the game on your system, you need to download the linked file and then extract the file into your preferred folder. When you extract the file, the game setup will be prepared. What makes the game best than the other competitors is that users are eligible to quickly add the custom songs according to their preferences. So, if you want to play the clone hero. You need to add the custom songs in the folder there. The process is simple; you can drag or attach the songs in the game. Finding the custom songs is very simple. You can find out hundreds of amazing pieces on our website. In the previous sections, we have provided links to best clone hero songs and charts. You can enjoy the clone hero game with classic guitar hero 3 songs. Here you can find the list of all the guitar hero 3 songs that were officially supported by the guitar hero 3: legends of rock game. The download links are also available there so you can download and add the guitar hero songs in your clone hero game setup. You can download clone hero game for your PC, Mac, or Linux operating system from the links given below. 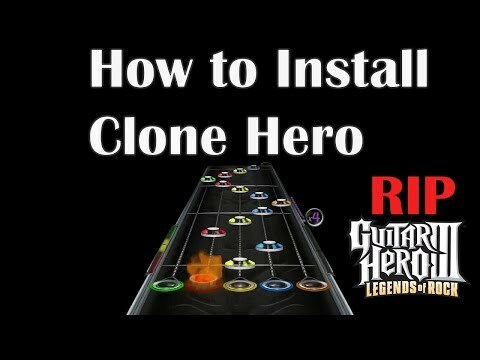 After downloading the clone hero game from the above-given links, you can simply install the game, add your own custom songs, and can enjoy the game! If any download link doesn’t work or you face any difficulty in installing the game in your system. You can comment below about your query and we will instantly provide you an appropriate solution. If you have ever played guitar hero game, you would love to play this game as well. Though, it is the clone version of the original game. But, it has a lot more to offer you. Such as, you are open to adding your custom songs according to your own taste, which is one of the best features of the clone hero game. Adding songs and charts into the game settings is pretty simple as well. In this post, we have included everything you need to know about clone hero game. From clone hero download options to clone hero songs and charts that you can add to enjoy your game, plus, a guide about how to add songs and charts in the game. The developers of clone hero game are continuously working on the latest updated versions of the game so users can enjoy as much as possible and without any errors and bugs. Unlike guitar hero, the best thing about clone hero is that the game is totally free to play and you can make your day playing this game without any cost! So, just have a decent Play station with clone hero installed in it, a good game controller and enjoy! What is clone hero? It is a clone version of original guitar hero game developed by Srylain. But, it features much more interesting stuff for its users. Unlike guitar hero, the clone hero is completely free to play with all the premium features of game. Does clone hero support drums? No, the clone hero does not support drums. But, according to the official news, drums are planned for the future and they are not implemented yet. How much does a Guitar Hero guitar cost? Any guitar hero controller or even keyboard works out for guitar hero or clone hero game. However, some give you better control than others. The cost of these controllers differ and they range from $20 to $500 generally. Some commonly used guitar controllers for clone hero game include: Wii and Rockband guitars, World Tour and Guitar Hero, Warriors of Rock guitars, Guitar Hero 3 Les Paul, Guitar Hero 2 Xplorer. Find more about clone hero guitar here.